Home / Andrew Repair Bio. What is/are your experience or qualifications? 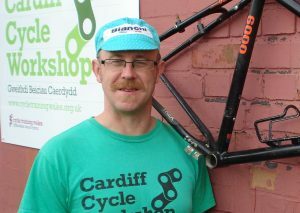 I have worked for 13 years as a bike mechanic – mainly in community settings such as youth centres, recycling projects, Dr Bikes and at the Cardiff Cycle Workshop. I am Velotech Gold qualified. What kind of riding do you do? I use my bike to get around town, love going for a ride in the Vale on a Sunday morning, do the odd Audax and have loved doing the Velothon every year. We all know about “N + 1”, what is N equal to in your shed/house/garage/lock up? IE; How many bikes do you own? I’m embarassed to say I have 7 bikes but most of these I inherited from my father and now I am too emotionally attached to them to downsize my fleet. Any hopes or thoughts for the future of cycling, cycle sport or cycling tech? In terms of keeping bike recycling going I wish that the cycling industry could make parts etc more compatable – it would save a lot of time and effort in the workshop !